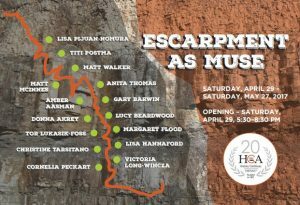 Fifteen artists have been invited to present artwork that have a connection to the Niagara Escarpment which runs form New York State, through Ontario, under Lake Michigan, Wisconsin and Illinois. Drawings, paintings, prints, photographs, sculptures, literary and collage artworks will offer new perspectives on the influence geography have on artists. The Bruce Trail Conservancy manages the maintenance of the marked footpath, and is the thread that allows people in both urban and rural areas to explore this geographic formation throughout Ontario. Home is Where We Are"After Dark"